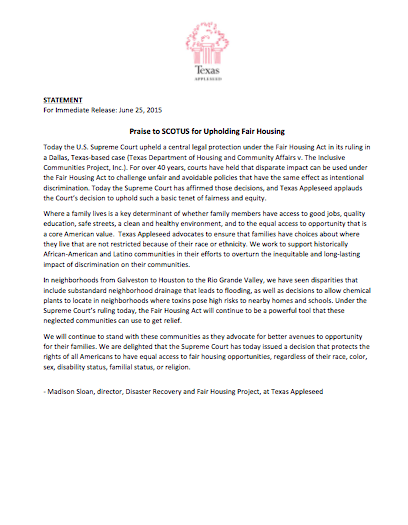 Statement on U.S. Supreme Court decision in the case Texas Department of Housing and Community Affairs v. The Inclusive Communities Project, Inc. 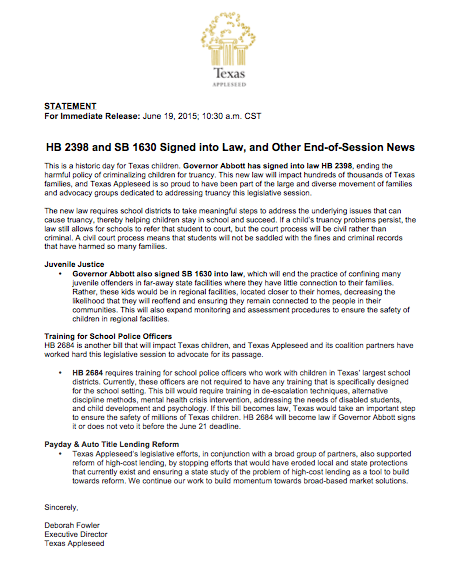 Administrative complaint filed against the Texas Education Agency (TEA) and 13 school districts. 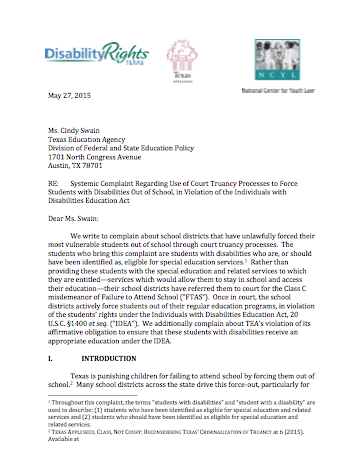 Complaint by Disability Rights Texas, National Center for Youth Law, and Texas Appleseed. 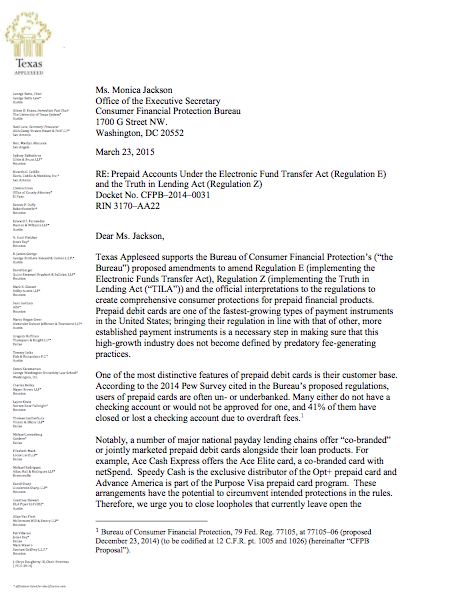 Texas Appleseed comments to the Consumer Financial Protection Bureau (CFPB) RE: Prepaid Accounts Under the Electronic Fund Transfer Act (Regulation E) and the Truth in Lending Act (Regulation Z). Docket No. CFPB–2014–0031. RIN 3170–AA22. 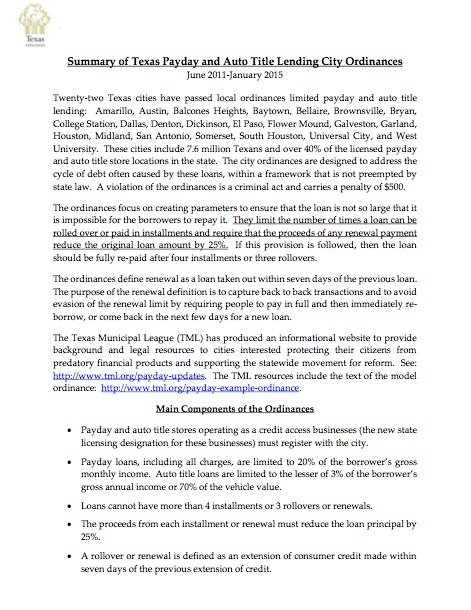 Texas Appleseed supports the Bureau of Consumer Financial Protection’s (“the Bureau”) proposed amendments to amend Regulation E (implementing the Electronic Funds Transfer Act), Regulation Z (implementing the Truth in Lending Act (“TILA”)) and the official interpretations to the regulations to create comprehensive consumer protections for prepaid financial products. Prepaid debit cards are one of the fastest-growing types of payment instruments in the United States; bringing their regulation in line with that of other, more established payment instruments is a necessary step in making sure that this high-growth industry does not become defined by predatory fee-generating practices.